Subscribe to IFAR's award-winning quarterly of news, research and feature articles. Incorporates the popular Stolen Art Alert, published by IFAR since 1977. 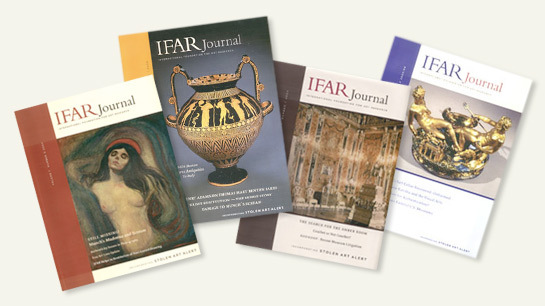 The IFAR Journal is available by subscription or as a "benefit" of membership/support ($250 and above). It is not available on newsstands. Subscriptions cost $75 per year for four quarterly issues (subscriptions outside the U.S. are subject to an additional $25 charge for shipping and handling). Subscribers also receive notices about programs and discounted admission to IFAR Evenings.